No more struggling with a generic tool to perform FMEAs. 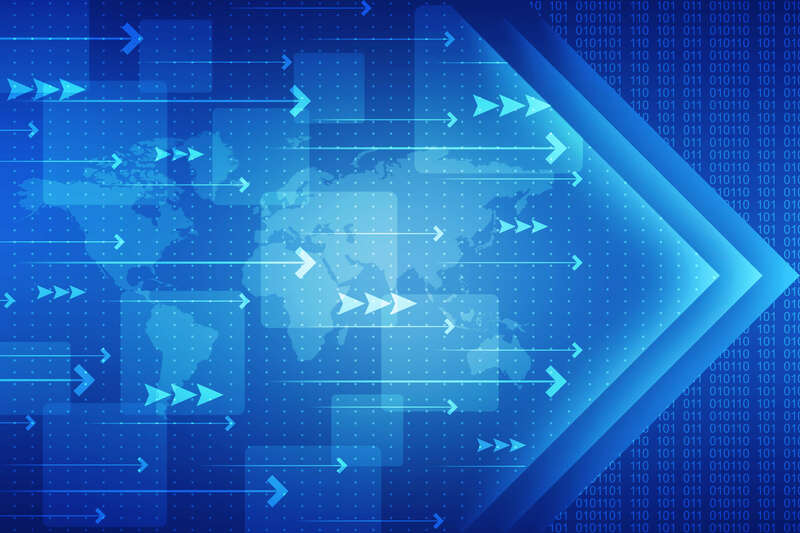 FMEAs require the efficient handling of a large amount of data. The organization of this wealth of information along with team collaboration activities are key to effective FMEA management. This is where Relyence FMEA shines. Wrapping an intuitive interface around a feature-rich FMEA package, Relyence FMEA enables you to manage your FMEA process with ease and efficiency. Generic-use tools are no match for Relyence FMEA with its intuitive interface, built-in calculations, audit trail tracking, and the Knowledge Banktm for unmatched reuse and automation. 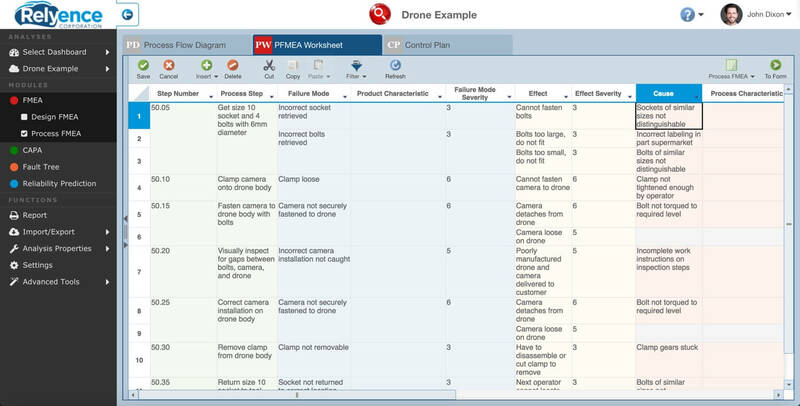 The customizable FMEA worksheet provides an intuitive interface freeing you to focus on improving your system. Your work center in Relyence FMEA is the Worksheet. The Worksheet is tailored to the FMEA template of choice, with color-coding and data grouping to aid in understanding. Auto-complete functionality is built-in to allow quick and easy reuse of your textual data to ensure consistency, eliminate errors, reduce the time required to complete your analysis, and significantly improving efficiency. Worksheet layout is completely customizable and functionality is intuitive and mobile-friendly. The Relyence FMEA Worksheet view is augmented with the Relyence FMEA Forms interface that offers a form-based view of your FMEA data. The Form View supports the same features and functionality of the Worksheet interface. 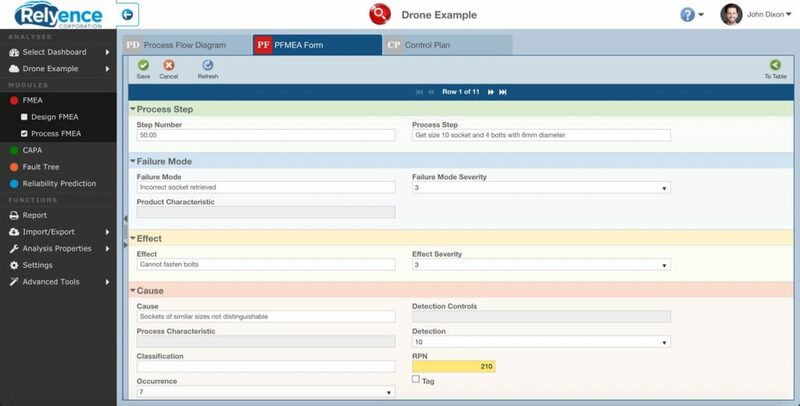 The Form View can be used as your main interface if you prefer, or you can access it on-demand to get an expanded view of a single FMEA line item. Moving between the two views is a streamlined one-click operation. Forms can be customized for process or design FMEA analyses in the manufacturing, healthcare, medical and other industries. Calculations are automatic with user-definable color-coding to highlight RPN results. Relyence FMEA supports the calculations necessary for risk assessment of your failure modes such as Risk Priority Numbers (RPN) and criticality values. RPN values are color-coded based on risk level, and can be customized to meet your needs. Relyence FMEA RPN and criticality values can be included in your Relyence FMEA Dashboards allowing you to monitor these vital statistics at a high level. The FMEA Knowledge Banktm provides a powerful way to organize and automate your FMEAs. Add any FMEA information from your FMEA to your Knowledge Bank – FMEA Functions, Failure Modes, Effects, Actions, and even full components or systems. As you perform your FMEAs, use the flexible search feature to mine your Knowledge Bank for information pertinent to your analyses. Another single click, and that prior knowledge is retrieved into your current analysis. Never lose any of your critical lessons learned! Plus, the Relyence FMEA Knowledge Banktm keeps your FMEAs in sync automatically, if you desire. Modifications made to your Knowledge Bank data can ripple through all your FMEAs that have data ties to the Knowledge Bank. 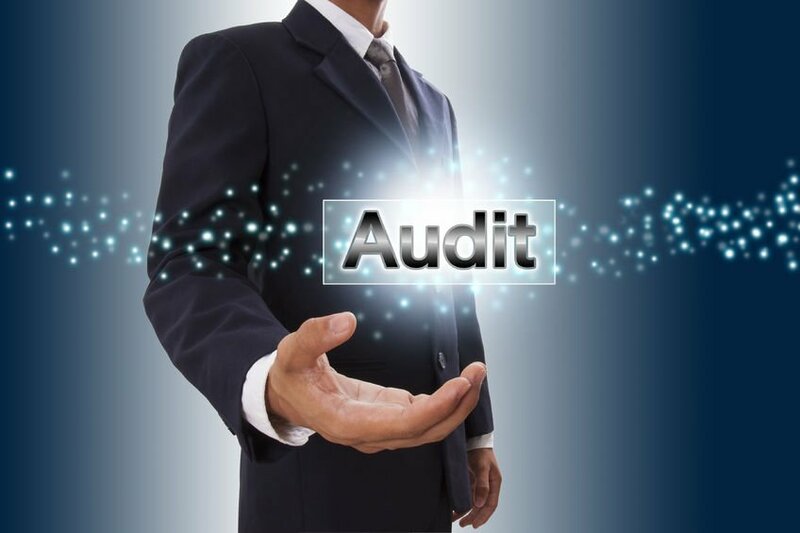 Relyence FMEA supports Audit Trails to track and record all data changes made to your analyses. Often used for security and tracking purposes, audit trails provide a detailed log of data modifications. Audit trails are also helpful to answer critical questions such as “Who made this change?”, or “When was this change made?”. By individual data field. For example, view all changes made to the “Recommended Action” field. By line item. For example, view all changes made to a single Failure Mode. Entire FMEA. Generate a full audit trail report for your entire FMEA to an Excel or CSV format. Excel-based FMEAs are no match for Relyence! Text phrases are organized and managed for you. Built-in auto-complete ensures consistency and accuracy of wording of your failure modes, effects, causes, and all your FMEA information. 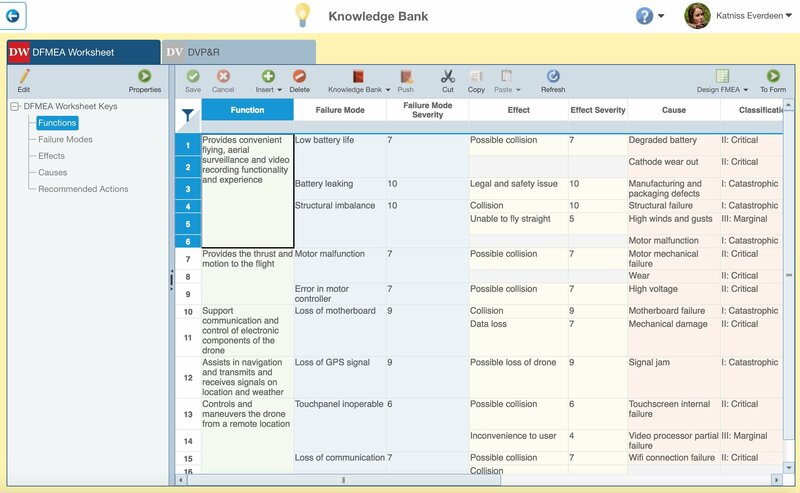 The innovative FMEA Knowledge Banktm provides a powerful way to organize and automate your FMEAs, and ensures you capture and retain lessons learned. PFMEAs, Process Flow Diagrams, and Control Plans employ Relyence FMEA’s unique always-in-sync™ technology so your PFMEA process remains in control and completely managed. Piece-part FMECAs can access the built-in FMD-2016 Failure Mode Distribution database for efficiency and automation. Relyence FMEA is available in the cloud over the Internet for quick and easy collaboration. Relyence FMEA operates on your PC, your Mac, your tablet, and even your smartphone. You can easily import your analyses from Excel or other applications. Support for hierarchical FMEAs allows grouping your analyses for a powerful organizational method. You can easily create FMEAs for multiple iterations of your product or system, all in one place. You can create FMEAs based on other FMEAs including both layout options and previous FMEA data. You can create multiple views of your data and switch between them in a single click. Custom block diagrams of your system provide a high-level graphical view.